This report argues that the current strategy’s centralised and top-down deployment markedly reduces local capacity to find tailored solutions that make sense for a given community. The Prevent strategy’s move away [As Prevent Centralises, Community Engagement and Local Capacity To Implement Local Tailored Solutions Falls] from community engagement to a centralised approach is not likely to assemble necessary resources, partners and stakeholders to address the issue of extremism that has changed so significantly given social media platforms and the use of the Internet. However, it should also be stressed that calls by some community groups to scrap Prevent are naïve and politically immature given the continuing and sustained terrorist threat to our country which has so violently taken so many lives. The 2011 Prevent strategy fixates on ideology and religiosity at the expense of understanding propensity for violence. It excludes and isolates groups that do not fit into its narrow definition of ‘British values’. By operating through a highly centralised approach to disrupting extremists, the Prevent strategy runs the risk of deteriorating the healthy liberal public sphere deemed necessary to opening counter-speech and debate that can challenge the intellectual basis of genuinely violent extremist opinions. The strategy’s current fixation on ideology runs the risk of alienating and excluding potential partners that have the penetration and information needed to actively challenge extremism. Local actors pushing to incorporate Muslim voices in the process and review of Prevent can mitigate these problems to an extent. While making Prevent leaner and more focused is a positive approach, it should be done in conversation with communities rather than through centralised decision-making structures. In essence, the move in the strategy is one away from addressing radicalisation through communities, securitising them instead of treating them as partners and leaders. Further, the fixation on ‘ideology’ and ‘non-violent extremism’ will alienate members of the Muslim community who under the previous Prevent agenda were able to access spaces to express dissenting voices. The danger today is that these spaces will be suffocated, along with space for dissenting voices. Whilst we may not agree with some groups and individuals who fall foul of the ‘British values’ espoused by the Home Secretary, it is important to acknowledge that some groups who do not believe in democracy need to be challenged openly and through debate and discussion. Pushing them to the margins and using pressure to cancel venues simply will drive these views underground and could further alienate individuals who may feel that they have no stake in the social life of our communities. Where Prevent training was previously conducted in partnership with the local Muslim community, the new strategy clearly sees Muslim organisations and institutions as targets and recipients of training without any capacity on their own to challenge extremist views, rather than equal stakeholders in countering-terrorism. Encourage the Metropolitan Police Service to focus Channel referrals on clear cases of illegal, violent speech and use alternative measures such as working with families for cases of ‘non-violent extremism’ or deviation from ‘British values’. During the commissioning process for the CTLP, ensure that the Local Authority representative has consulted with various community groups from all faith groups and is able to represent their voice and ensure that the CTLP commissioning process benefits from a balanced approach. 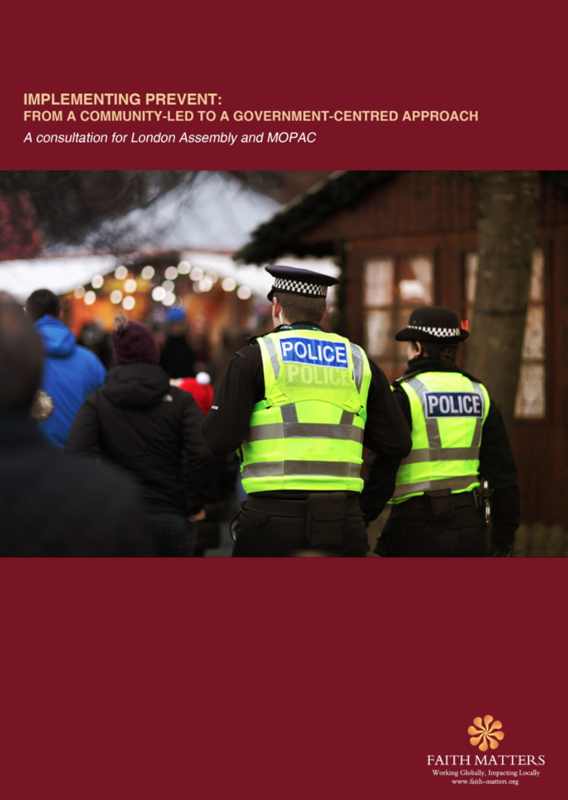 Encourage the Metropolitan Police Service to engage with and be aware of the dynamics of Muslim communities and work with communities to tackle anti-Muslim hate and intra-Muslim tensions, viewing them as real partners and not through a simple securitisation agenda. Local authorities should engage with groups critical of Prevent without funding them. Their views should be taken seriously when planning Prevent projects alongside a diversity of other voices. Ensure that safe spaces for young people to voice their opinions are available without fear of referral to Channel. Universities must have clear policies about speakers but also err on the side of freedom to debate and challenge, teaching students how to challenge views in a nuanced and critical manner. The starting point for universities should be to encourage debate and free speech, though also acknowledge that student societies need support, monitoring and clear frameworks around respect for core human and civil rights for all. This means tackling to gender prejudice and enforced segregation within student societies, for example.